Outstanding cover by David Millgate. Inside there's an advert for a new Dark Judges story starting in Meg 400. The Torture Garden, by David Hine and Nick Percival. The Sons of Booth have gone mental after watching to much TV and are on a mission to rescue the man that killed the planet. Someone shoot these fools. Survival Geeks is still going strong and this is my favourite story arc yet. Good stuff! An old friend returns in The Order and another guy forgets how to dance. I love this series! Mechastopheles gets a bit dark and a little girl loses her temper. I'm enjoying this series and this in particular is a very fine episode. Grey Area twists and turns like a politician. Excellent final episode to the current arc. Great Prog - Long may it continue! I think things are going to go 'very' wrong in Grey Area. A superb prog in my opinion. This latest series of Grey Area has been very good. I'm warming to Mechastopheles. This is the sort of series that belongs in 2000AD every now and then -- giant demon-possessed robots fighting other demons in an apocalyptic world. I like Survival Geeks, and this one in particular has been funny. Judge Dredd is alright. I'm not a fan of The Order I'm afraid. Looking forward to Megazine 400 next week, The Torture Garden especially. I thought Wagner would be writing it, but Dave Hine is good too so I'm not disappointed. Excellent prog, and since 2097 only arrived Friday morning, I was able to read them back-to-back! Laughed out loud at Survival Geeks. I love that strip. Grey Area takes a slightly predictable turn but nothing worth getting worked up about. Okay so maybe I was in a bit of grump last week, or maybe two stories that bugged me have genuinely got better in my eyes? First Dredd. I didn't like the fact that a story that's run for some time was going to end on a simple sting, and some action. However this week while that didn't change much it was well fleshed out. More significently it added some nice touches to remind me why the storyline as a whole has been so enjoyable. "Control the narrative, we control the outcome." which has been a clear theme and this makes the sting work of course. I'm settling more with the stupid gun being linked to the themes as well, lets see how its used in the imminent end. With a single part to go it will be interesting if they pull everything together in a satisfying way, but I have more hope than last week. Secondly Survival Geeks won me back over... and in this case I'm not sure why, but it did and have to say in the past when this strip has lost me its never done that so very interested to see if it sees this through to the end? Elsewhere much as you were really. The Order is simply superb and really starts to pull things together, while pushing things further. Love this and can't wait to find time to re-read. I think Mecha-somestuffhappenin but for different reasons. In this case as I've stopped caring enough to pay attention. Grey Area nicely sets up our next developments and while in what is a quieter affair it sets up its return very well. So next week we'll see how the other strips making their landing. And then a relaunch. With this and Meg 400 we certainly live in interesting times. Bags of fun in Survival Geeks, plus action in The Order and genuine excitement in Mechastopheles. I'm anticipating the next part of Dredd, too. Still four out of five from me, but quality proggage. Nice to see a Millgate Dredd again, too! Loving Dredd just now, Sons of Trump are a classic MC1 bunch of nutters. Dredd character spot on too. Survival geeks is great too, love that art and the dialogue, but I fear that not watching these films I miss sooo many Easter eggs. Grey area is as expected, while I just pretend the other two tales don't exist. Buttonman missing from the lettes page... he must be back inside. I really like the 90s-tasting Dredd cover. Dredd was good. I’ve been enjoying this story and the artwork is excellent. Survival Geeks was fun. I didn’t enjoy the Doctor Who one at all but this genuinely funny and exciting. The Order baffles me slightly but I still enjoy it. It reminds me of being a kid and watching programmes or films I didn’t understand, just enjoying the spectacle. Mechastopholes is a strange one. I don’t feel like I’m getting to know any of the characters and the big robot hasn’t really done anything. When they used to make episodes of Knight Rider they had to have a KITT quota. The car was always given something exciting to do as that was what the kids were tuning in for (even though the stories were really about Michael Knight). Mechastopholes feels like an episode of Knight Rider in which KITT sits in a multi storey car park for the entire 45minutes. Grey Area is the best thing in the prog again. Tharg, please say we’re going to get a run of complete Grey Area reprints at some point! Matters of scale dominate this week, from the elastic proportions of Armoured Gideon, who's sometimes big enough he needs to duck to fit through a doorway and then as big as a house a few panels later, to an okay Dredd story that feels twice as long as it needs to be. The return of Staz Johnson's hugely welcome, but that opening shot of judges on bikes reminds me of Phil Elliott's Little Tyke lawmaster, mentioned on the Droids You Forgot thread, recently. Staz could do with avinit large, but I'm as big a fan of the chunky, industrial design of his bike as I am of the rest of his depictions of MC1 technology. The only thing that isn't epic about Grey Area are the A-cups in the shower scene. Represent. * The early nineties, to be precise. Bollocksed that up by posting too early due to a weird key-press combo, but you get the idea. 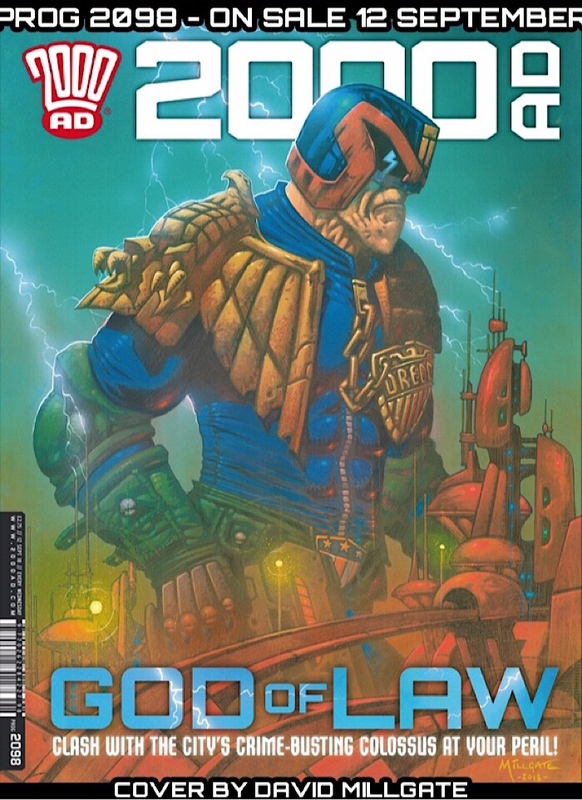 Another excellent prog in the current run, 2100 has its work cut out. Dredd moves along its interesting path, and although the pacing and structure of the episode feel a bit odd, that might be because we're not usually privy to Dredd's cunning plans until some last minute revelation (e.g. Apocalypse War, City of the Damned, Oz). Here, we're seeing Linus & Co blundering into Joe's trap over several episodes, which seems like rare ground for the strip - although the immediately previous 'Better Class of Criminal' story had a somewhat similar gimmick. And while I'm not looking forward to seeing the whole gang go gaga (or super-intelligent!) when the Stupid Gun misfires next week, I am hoping that they'll be revealed as just one cell of a larger movement. It's a good concept that should stick around, giving a bit of breadth to the democracy movement. Survival Geeks vies for top-spot this week, just so much fun in every panel. 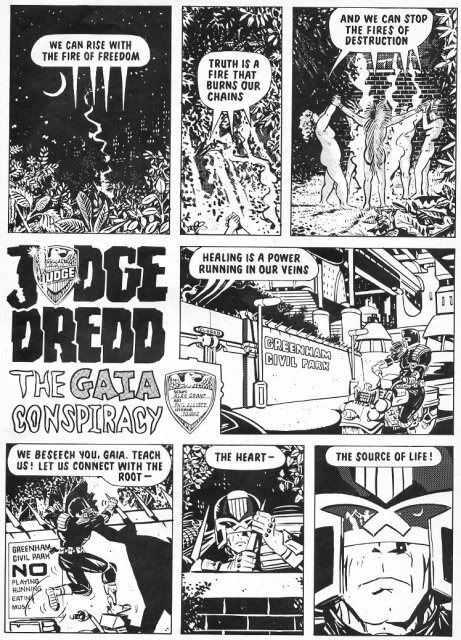 I know I bang on about how completely delightful I find Googe's (and Caldwell's) art, but really it's become spectacular: just have a look at the original 3Riller to see how far he's spread his wings over the course of this strip. Fighting a strong urge to go out and buy the collection, even though there are a dozen books head of it in the queue. The Order: Yay, he's back! Fight choreography gets a bit muddy this week, AG/C should really have more of a presence, but that magnificently executed first page more than makes up for it. Mechastopheles: Not sure how I feel about the plot shortcut that the portals represent, or the abrupt loss of the intriguing Cardinal Cesare, but for the third week in a row I'm fully on board the robodemon. Hopefully a return to wastelands wrassling next week doesn't dislodge me. And then we come to the crowning glory of the current run, Grey Area. Another astonishingly brilliant 5 pages of talking heads, which even managed to make the by-now ubiquitous ETC shower scene feel sweet and natural. Abnett's only-in-comics approach to what is essential a 3-page dialogue showscases just what a craftsman he has become; and I challenge the Glimmer Rateratti or Vermin Stans to say this series isn't Harrison's masterpiece. 2019? But I want it now! I love Survival Geeks - I've always found it to be refreshing fun among the more serious accompanying stories that surround it. I'm very much hoping Benjamin Wood's request is ignored because if it isn't, I'll be putting forward my own request that the confusing snooze-fest called The Order is ousted too. Honestly, I've given up reading it. Other than that, a fine prog - I'm looking forward to the next batch of stories commencing soon - especially excited about the return of the Fiends Of The Eastern Front.